Learn how to draw man's body muscles torso anatomy for superhero type step by step and video tutorial. Drawing and sketching tutorial of male anatomy body, man torso or upper body, chest, abs, ribcage and shoulder: front view male muscular warrior type character design for comics, manga, anime and video game concept art. Learn how to draw simplify torso and upper body using geometric shape for Manga Anime comics: Step by Step video tutorial explain. 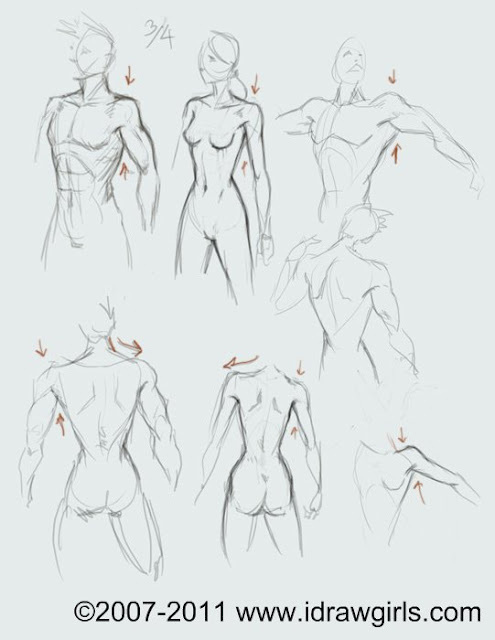 Here is a video how to draw body muscle tutorial. There is also a few more basic tutorial if this is too fast drawing here: how to draw man upper body basic, Drawing muscle body basic -torso 3/4 with shoulder and arm Male (man) and Female (woman) upper body 3/4 view. How to draw arm and torso together, this one is pretty much a Q/A from the readers. How to accurately draw arm connect to shoulder and torso. Alright, the video previously upload to youtube and now I am posting together with step by step image. 4)Then I stop right here...the overall torso is quickly done. 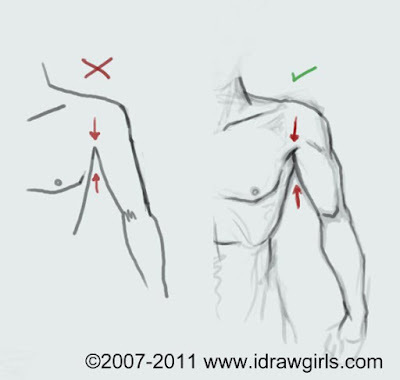 Some tips about drawing arm in connection to the shoulder. Comparing male and female body basic figures. Basic lessons on how to draw more manly character how to draw barbarian warrior character and drawing arm muscles bicep tricep. Also there are videos on portrait. Then these tutorial will guild you to a basic how to: How to draw lesson girl face, How to draw person head basic. And digital painting tutorial rogue samurai female. As for the face or head (women, female) Draw girl's face how to lesson video and step by step and learn how to draw face, woman. Enjoy the video tutorials. For a full man's body tutorial go to How to draw a man's body, plus 2 hours of video tutorial in depth. 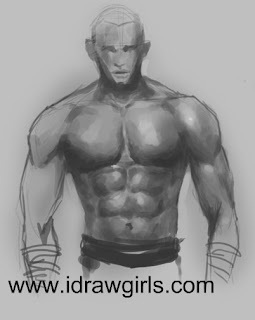 Full Length tutorial on How to draw and paint full color Male Anatomy for Artists. In Depth and Intuitive! How to draw man's body. Premium tutorial. Good job Xia! I hope to be one of those who's doing good body artwork on the Community! :) Thanks for your great tutorials and help. Take care bro and keep up the good job you're doing here! Luca> Thanks brother. :) Your work itself shows that it has come a long way. Glad I could be a little bit of help.